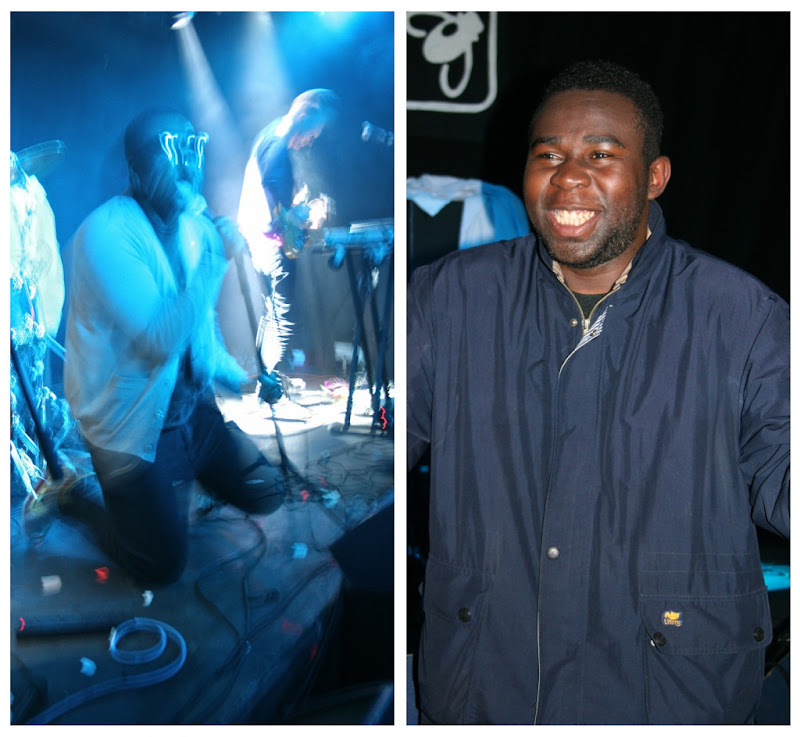 thursday night i took a much needed break from the relentless studying and went to a gig at the barfly in london. think about life were playing and, while i realize this isn't a music blog, can i just say that they were absolutely incredible. never before have i seen so much energy and enthusiasm from a band and, in particular, their lead singer Martin Cesar. it really was electrifying. plus, it didn't hurt that he dedicated what happens to be my favourite song 'set you on fire' to me... what can i say, i'm easily won over. while his confidence on stage was undeniable as soon as he stepped off he was completely down to earth and didn't exude the loftiness of a performer whatsoever. he wore some pretty awesome multi-coloured boating shoes that i sadly didn't manage to capture. afterwards, the equally cool Connor Hanwick and Jonathan Pierce from the new york based group the drums did a DJ set. there were lots of cool kids around and in particular i spotted this pair who were seriously rocking out during the gig. the guy, who mentioned he works for Mark Fast, was wearing this awesome studded denim vest (vintage levis diy possibly? i'm not too sure - i didn't have the chance to ask). i also love the way the girl, who was with the band, is playing with proportions. the high waisted straight red skirt with the very oversized flannel is a refreshing twist on the normal short stretchy bandeau skirts that everyone has been wearing. on our way home mr. crusader trooped around the insanely bright corner shop in search of salt & vinegar crisps... sadly they were all sold out. but it offered yet another example of bright colours.... paired together in a random and haphazard manner - they somehow work to create something appealing. 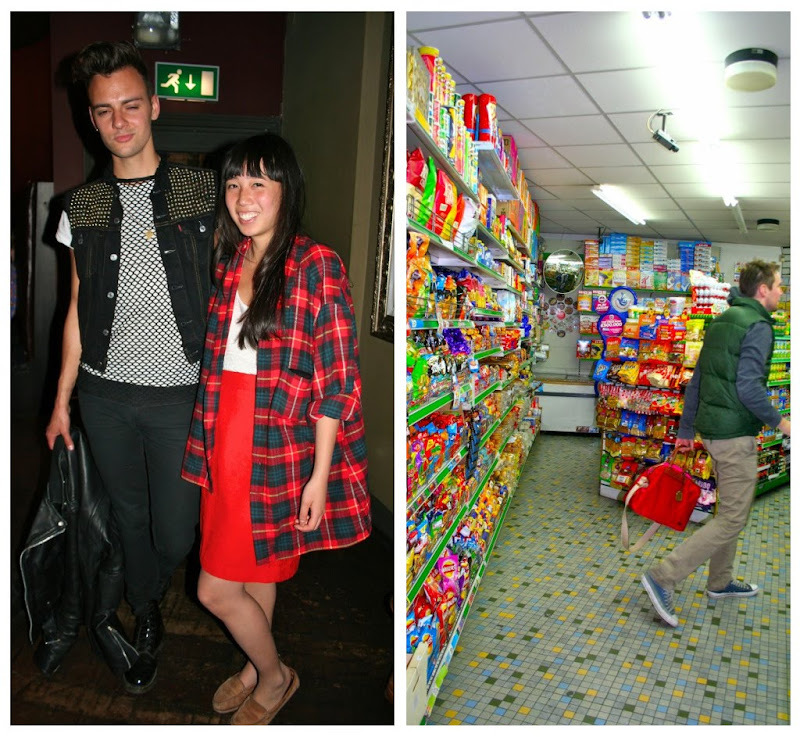 what do you think, can a convenience store qualify as fashion inspiration? p.s. that's my red bag he's carrying, don't worry, he hasn't pulled a joey and opted for a girly man-bag.